I have had the privilege of being in Israel several times. I was there again last month. There are many, many stories I could tell! 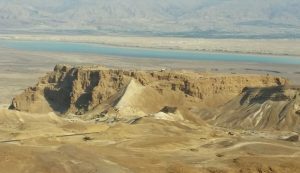 Most of my trips have included a trip to Masada, that huge “rock” near the Dead Sea. It is known as the place where the Romans finally conquered the Jews who had fled from Jerusalem in 70AD. It protrudes 1200 feet above the Dead Sea. You could put any US sports complex on top of it. It is huge! This little picture does not do it justice. I have always gone up and down Masada from the East side (the Dead Sea side). This time I ascended the East side, but descended the West side. We walked down the “Roman Ramp.” Do you see it in the picture? The Roman army set up several encampments around Masada in order to conquer it. They could not. It was impenetrable. Then, at some point a Roman Captain came up with an idea. “If we put enough rocks into this huge ravine, it will become a ramp!” So, he picked up a rock and put it in that ravine. He ordered others to do the same. Rock after rock were put into that ravine. It took months. But, eventually, they saw the ravine fill up. They kept at it until the ravine became a ramp. Then, the Roman army walked up the ramp, used a battering ram and broke through the wall. Here is my question: “Which rock was most important?” They ALL were! Each trip and each rock mattered. It was the long-term effort that accomplished the goal. Why did I think of Luke 18:1? Because sometimes, each of our prayers are like one of those rocks. Sometimes we are called to pray for something that seems impossible, just like filling up that huge ravine did. But, as we and others “keep on praying” each prayer matters. So, let’s learn from the Romans as we pray. One rock at a time.